The amounts given will serve two as a snack, or one as a meal - increase the amount of ingredients as needed to serve more people. Preheat the grill or heavy saute pan. Do the same with the onion slices. Put the beans in a mesh strainer and rinse well, shaking to get as much water off them as possible and set aside. Cut the zucchini so that the slabs will fit on the tortillas, and cut each onion slice into quarters, separating the rings. Heat a cast iron skillet or griddle over medium heat. Lay out the tortillas and brush lightly with olive oil. Place two of them oil side down in the skillet. Sprinkle each tortilla in the skillet with a small amount of cheese. Layer on the zucchini, beans, onions, radishes, cilantro if desired, and end with another sprinkle of cheese. Don't pile on too much stuff, because it will just fall out the sides when you flip them. Top with the remaining tortillas, oil side up. Cook until the bottom side is getting crispy, about 3 or 4 minutes [it won't brown very much], and carefully flip each one over, using a wide metal spatula or turner. If any of the fillings come out, kind of shove them back in with the spatula. Cook on the second side for another 3 or 4 minutes, and move to a cutting board. 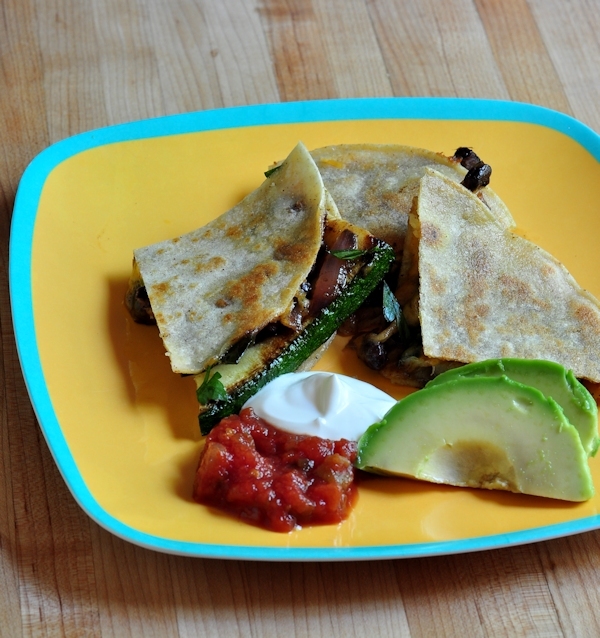 Cut the quesadillas into quarters, and serve immediately with the condiments.